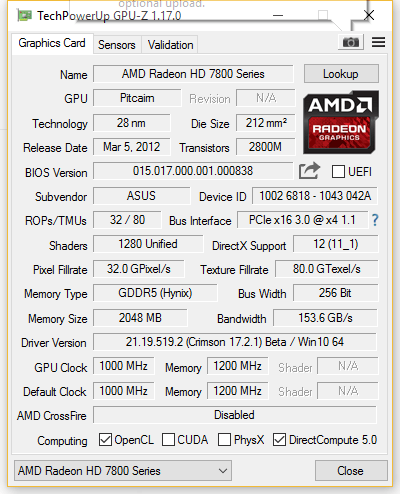 for a long time I hunted for a UEFI GOP VBIOS for my HD 7870. So,no luck with TPU or overclock.net (may point you in the right direction) ? My card is made by Asus, not sure how well somebody else's ROM will work? It should work. Pay attention for RAM and GPU frequencies. It is more important than BIOS producer. As i can understand, there is no UEFI BIOS for your card made by ASUS. What does this say? Problem is there is no 128KB VBIOS anywhere, so they must have it hidden somewhere. That would be illegal in Canada. This package contains VBIOS and tool for flashing. Just use it. i do not see and vbios.rom or any other 128KB files, i was able to save my card VBIOS with the ATI flash tool. My OEM VBIOS is 128KB saved as bios.rom. As i can understand this file (14.36 MB) contains BIOS and Flash tool in one package like laptop BIOS update file. Execute it and we will see am i right or wrong. 02/28/2017 10:55 AM <DIR> . 02/28/2017 10:55 AM <DIR> ..
Can i see this whitelist? No GUI interface .No confirmations or prompts to restart. Just black DOS window for a couple of seconds. You should check your VBIOS status. Maybe you already flashed it. 2.Your PCie speed is 4x only. Why? Are you using your 7870 in second PCIe slot? No. Power saving functions can drop only PCIe generation version. From 2.0 to 1.1 in your case. PCIe speed must be constant. It looks like you have some other problems besides UEFI support. I have mentioned BIOS issues to MSI but so far nobody has got back to me. I guess if the board boots its good enough. This is not a high-end board. Yes. If you have two cards in both PCIe slots it will be 8X+8X but it must not drop to 4x at any circumstances.At least for first PCIe slot. Sorry..I don't understand why i need your second two links. Have you any answer from ASUS? Maybe you need to buy motherboard from that whitelist. Probably it will resolve all of your problems. You don't need their "support"
You just need motherboard from whitelist for flashing procedure. I do not have a board/cpu from the whitelist available. last one stopped working which is why I have this MSI board. Considering the nonsense with this card, now everyone can see why i am now loath to even see Asus on some store catalog of hardware. Whitelists, give me a break. I have already updated the VBIOS, then extracted the VBIOS rom file and uploaded to Baidu Netdisk in above URL, download it and use ATIFlash to try.